In February 2000, an upstream tailings dams at the Baia Mare gold mine in Maramures County, Romania failed. The failure is thought to have been caused by a combination of poor design, unforeseen operating conditions and heavy rain and snow, which resulted in overtopping (BMTF 2000). Two months later, this failure was followed by another upstream dam failure at the nearby Borsa lead and zinc mine, which also occurred as a result of overtopping. These two incidents released more than 200 000 cubic metres of contaminated water and 40 000 tonnes of tailings into tributaries of the Tisza River, a major tributary of the Danube (WWF 2000). The Baia Mare spill was the most damaging of the two failures, releasing 50 to 100 tonnes of cyanide, as well as copper and other heavy metals, making it the worst environmental disaster in Europe since Chernobyl. Over a four-week period the combined spills travelled through Romania into Hungary, Serbia and Bulgaria, and finally entered the Black Sea. 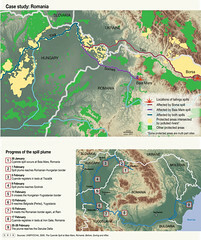 The spill traversed a number of ecologically sensitive and highly populated areas, with significant transboundary implications. Acute effects of the cyanide were observed along the river system to the point where the Tisza River meets the Danube. The Baia Mare failure created a 30- to 40-kilometre-long wave of contaminants that wiped out the flora and the fauna of the central Tisza River. Plankton were killed instantly by the plume; fish were killed in the plume or died soon after. 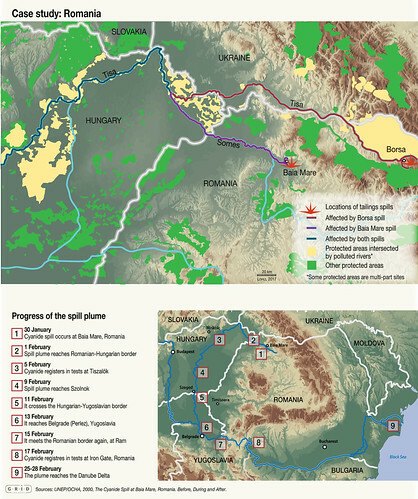 In the Hungarian section of the river, the impact was especially severe – it is estimated that 1 240 tonnes of fish were killed (UNEP/OCHA 2000). An international task force, chaired by the European Commission, was created to assess the damage and propose remedial actions (EU 2000). The task force insisted on the necessity of providing adequate emergency-storage facilities and recommended that new tailings storage facilities should not be allowed to store water or slurry containing cyanide in tailings ponds open to the elements (Lucas 2001).